Clean before and after placement in the mouth. Because the material used for fabrication is slightly porous, plaque tends to cling to the surfaces. Gentle scrubbing with a toothbrush and toothpaste will remove the plaque. A denture cleaning solution, such as Efferdent, will aid in the removal of plaque and tartar. Be sure to rinse the retainers thoroughly after cleaning to remove any cleanser residue. This wire should stay on forever. The only exception is if your family dentist says you are not keeping it clean and it is beginning to cause gum or bone problems. 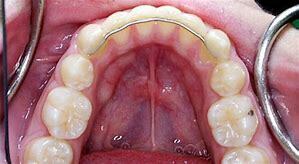 If this should occur, please have the wire removed and replace it with a removable retainer. The removable retainer should then be worn as Dr. Brown prescribes. The fixed wire will protect the teeth as the patient gets older and your facial muscles get tighter. Please have this wire monitored by your family dentist at your six-month check ups.